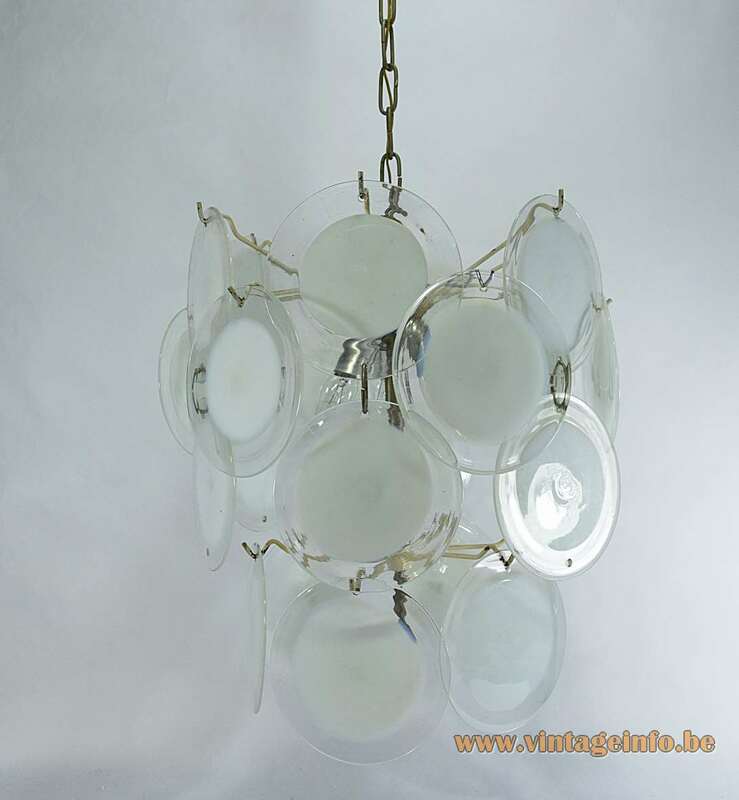 Materials: 24 Murano hand blown white and translucent crystal glass discs. Metal chromed frame. Any type of light bulb can be used, but clear or bright bulbs are preferred. 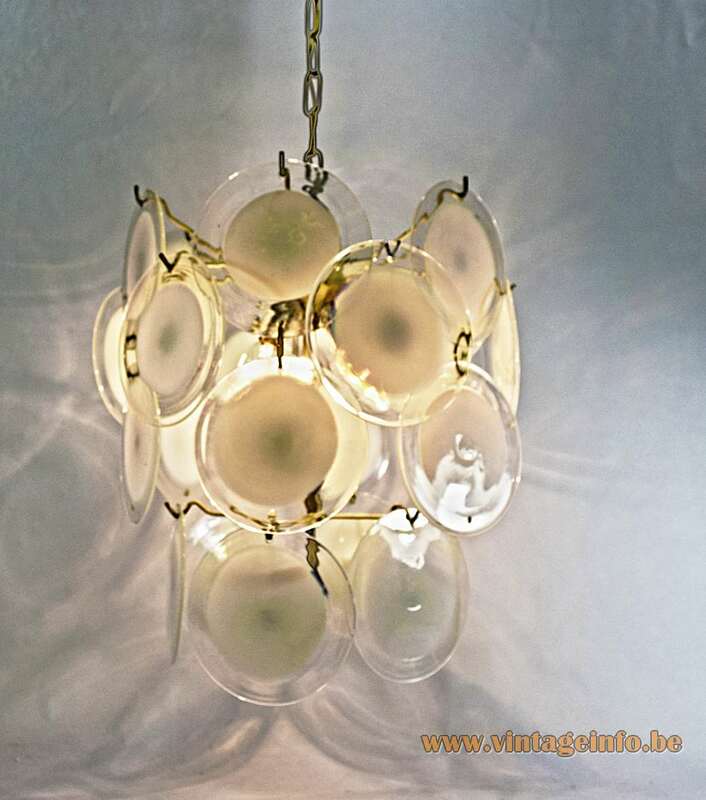 Manufacturer: Vistosi, AV Mazzega and many other producers from the Murano island in Italy. 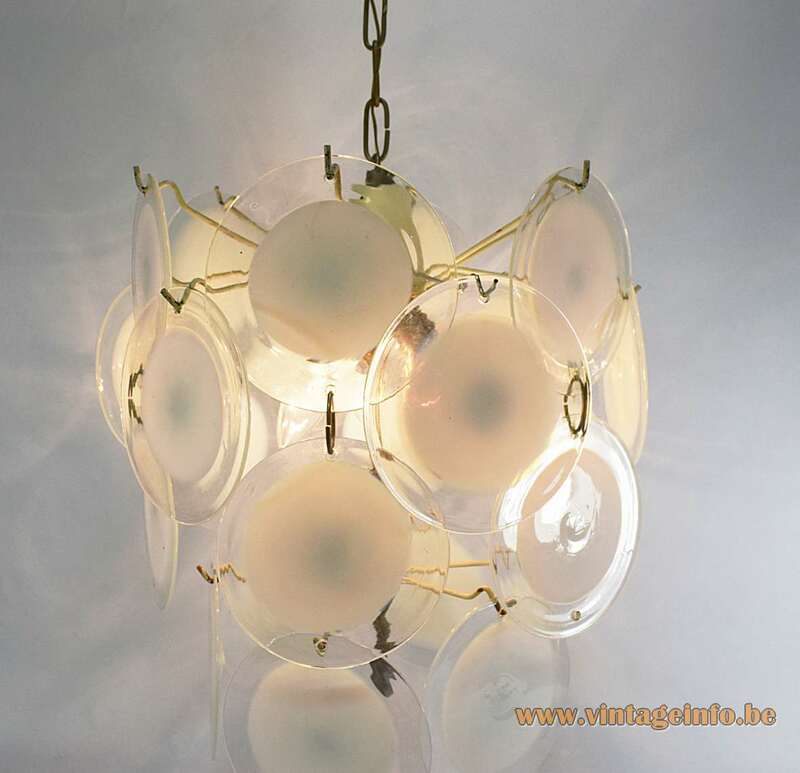 Other versions: Different sizes and colours, more or less discs, wall lamp, flush mount, table lamp. 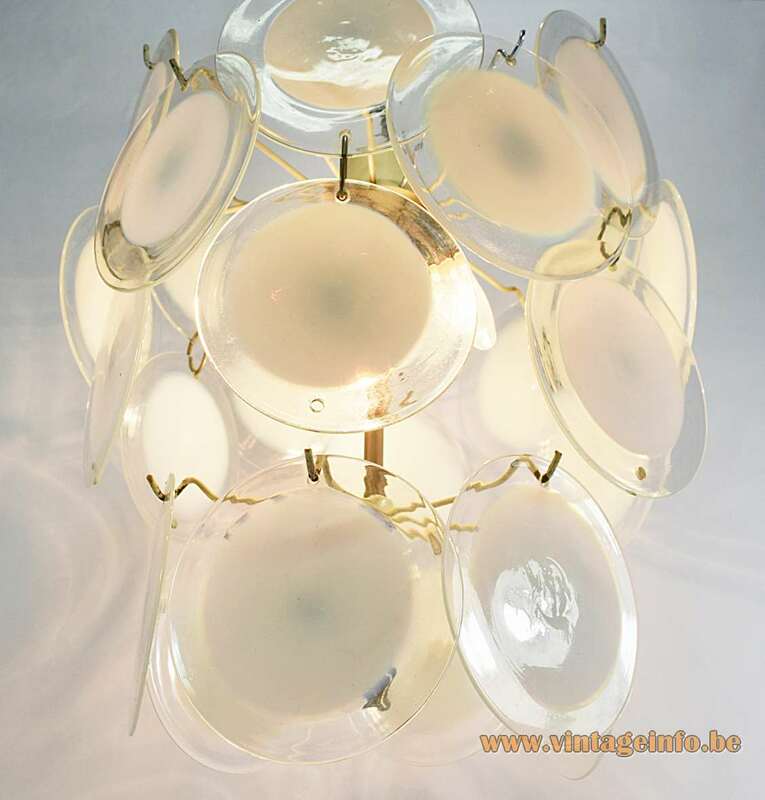 In Germany and some other countries in Europe acrylic discs chandeliers were produced among others by Aro Leuchte (Arnold Licht GmbH) from Borken. It is always said that Gino Vistosi designed these lamps, but all of the light producers on the Murano island made them. It was a big hit and they were made for more than 50 years. Few are marked or have a label. The largest producer was AV Mazzega. Today (2019) new chandeliers are in production. Also spare discs can be ordered. But if it has to be certain colours, it is obviously more difficult to produce them. 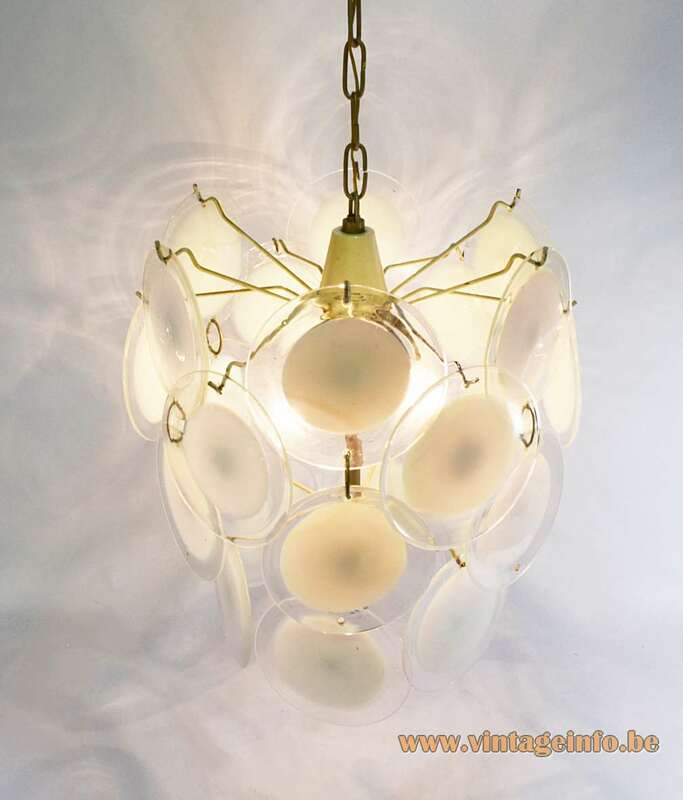 Vistosi was created by Guglielmo Vistosi in Murano in 1945 focusing on lighting. After his premature death his sons Gino and Luciano, joined their uncle Oreste in the founding of the Vistosi company. In 1956 Alessandro Pianon, a Venetian Architect, joined the company and together with second generation Luciano and Gino Vistosi they gave a swing to the company focusing on innovation and design. The company has employed some very relevant designers such as Angelo Mangiarotti, Gae Aulenti, Peter Pelzel, Ettore Sottsass Jr., Adalberto Dal Lago,Vico Magistretti, Enrico Tronconi and so on. 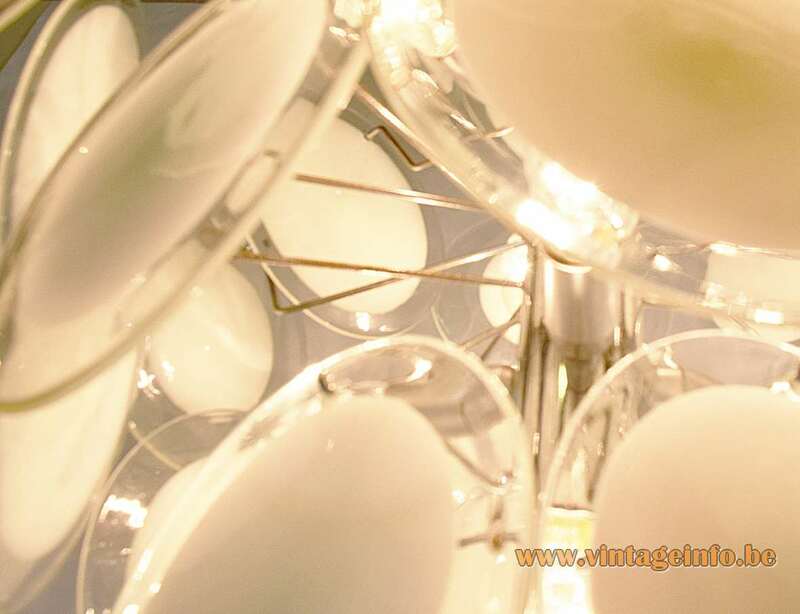 In 1989 Giancarlo Moretti, a businessman from Murano with a long experience in the glass sector with Vetrofond and Punto Luce, acquires the prestigious brand, giving birth to Vetreria Vistosi. In the 1990s the factory closed for a couple of years. It was reopened by Matteo Moretti, Giancarlo’s son, who relaunched the Vistosi brand. During the same period Vistosi acquired the brands Alox, G2 and Triade. Today, the company still produces the most beautiful lamps, some of them old classics. The sole survivor of the original founders, Luciano, born 24 February 1930, dedicated himself to research and glass sculpture until his death (in Venice) on 14 Mai 2010. AV Mazzega – http://www.avmazzega.com – website offline since 2018. The Facebook page of AV Mazzega is gone since November 2017. Mazzega 1946 is the new name of the company.